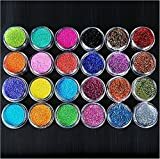 45 Colours Nail Art or Make up Decoration Glitter Powder.. Suitable for nail art decoration with nail polish, UV builder gel, etc..
Can add great sparkle to face, body, and any great night out. Suitable for your party or fashionable look..
With this set, you will be more attractive.. PRODUCT FEATURE: Can be used for face, body, nail art or craft. Face/Body: Apply glitter fix gel first, then add some glitter by brush or finger. This will keep the glitter in place. Perfect for Professional or Personal use. Comes in 45 bottles. Product Details: Diameter of each jar : 2.5cm. Net Weight : ~3g each. Color:Random Color (More the color than the picture shown,we will sent it by random.) Fine Loose Powder Glitter. 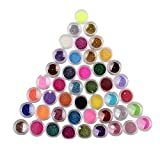 Package Includes: 1Set x 45 Colours Nail Art Glitter.100% Brand New in retail package. 24 Colours Nail Art or Make up Decoration Glitter Powder.Color may sent randomly..
Can be mixed with nail varnish for glittery party nails. Can be worn on the face and body.. 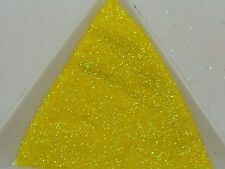 Perfect for 3D nail art or flat application..
For Micro Glitter apply the topcoat and sprinkle lightly over moist areas. Once dry seal with another coat of topcoat.. 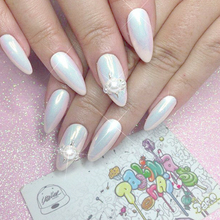 PRODUCT FEATURE: Can be used for face, body, nail art or craft. Face/Body: Apply glitter fix gel first, then add some glitter by brush or finger. This will keep the glitter in place. Perfect for Professional or Personal use. Comes in 24 bottles. Product Details: Diameter of each jar : 2.5cm. Net Weight : ~3g each. Color:Random Color (More the color than the picture shown,we will sent it by random.) Fine Loose Powder Glitter. Package Includes: 1Set x 24 Colours Nail Art Glitter.100% Brand New in retail package. 100% new in retail package. 24Colours Nail Art or Make up Decoration Glitter Powder. color sent randomly.